We’d love your help. 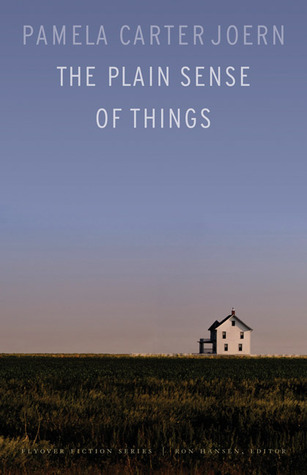 Let us know what’s wrong with this preview of The Plain Sense of Things by Pamela Carter Joern. In prose as clean and beautiful as the stark prairie setting, The Plain Sense of Things tells the stories of three generations of a western Nebraska family. These tales of sorrow and hope are connected by the sinews of need and flawed love that keep families together. A farm wife struggles to support her children after the death of her second husband; a young woman grapple In prose as clean and beautiful as the stark prairie setting, The Plain Sense of Things tells the stories of three generations of a western Nebraska family. These tales of sorrow and hope are connected by the sinews of need and flawed love that keep families together. A farm wife struggles to support her children after the death of her second husband; a young woman grapples with the shift from girlhood to motherhood; World War II wreaks havoc on those left behind; and a failing farmstead breaks a family’s heart. Amid hardship and change, these interwoven stories illuminate the resilience and dignity—and the subtle sweetness—of a life lived in clear view of the plain sense of things. To ask other readers questions about The Plain Sense of Things, please sign up. This one was meh. I did finish it because I wanted to see how it ended, but it was basically a series of vignettes from the life of a farm family. It was a bit all over the place and some characters were introduced, only to be forgotten by the next chapter or so. The focus was mostly on the 1940s/50s, and by the end of the book, the years were being rushed through. This book took me back to my family's farms outside Stanton, Nebraska. It was easy to imagine different relatives experiencing a life I didn't consider and gives possible explanations for their personalities. I thought of my grandfather, a silent man sitting in his chair. He was a hard father and probably not the best husband. We just never know what goes on behind closed doors and in people's minds. This was a very touching book for me. This novel made of loosely connected stories of an extended family starting in 1931 and ending in the late 70's is very realistic. It takes place on the high plains of Nebraska and is true to the characters and setting of everywhere on the high plains. It is very well written but in places can be depressing as real life can be. I liked the ending very much. This book followed members of the same family for half a century through their hardships living in Nebraska. It was snippets of each life, so it was hard to really get to know the characters (with the possible exception of Alice) and empathize with them. It was just ok for me... a quick read but nothing spectacular. About the dynamics of 3 generations of a rural Nebraska family. For such a short book, there were too many characters to keep track of and the story a bit depressing. Joern's THE FLOOR OF THE SKY was a great book. This one was a disappointment. I like to read about the wide open spaces of Nebraska so I picked this up at the library. The book covers different members of a NE extended family from pre-WWII to after the war. It's not the cheeriest collection, but it's a good Nebraska read. Loved this book. Another great family saga set on the plains of Nebraska. Captivates the love, disdain and hard work of a life made out of the land. Very clean writitng style. I couldn't put this one down. A lovely novel. The first 3/4 pulled me through very quickly, but I was a little disappointed in the ending, which felt like a too-quick wrap-up. Overall, a good fast read. A book in short stories. Family history in rural Nebraska across the 20th century. Very sweet and sad. A detailing of the "hard-scrabble life" through many different pairs of eyes in an accumulating series of short stories. Perhaps the understated, undemonstrative life is worth living. Good startrib review. MN writer. "The ways the heart weathers chronic hardship"